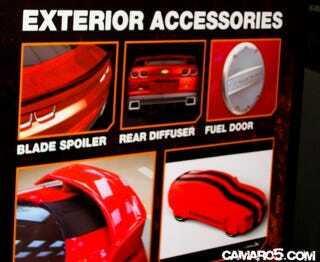 The 2010 Chevy Camaro fans over at Camaro5 have snapped some shots of the factory accessories from the unveil of the 2010 Chevy Camaro SS this weekend that’ll be available for the new muscle car from the American Revolution. In addition to the usual chrome wheels and cold air intakes, there will be a range of — how should we say this? — less tasteful bolt-ons including a high wing, colored engine parts, ground effect bodykits and color-matched lighted interior trim pieces. The full list, courtesy of Camaro5, follows the jump. Oh, and if the tarted-up red Camaro looks familiar, maybe it's because we've seen it once before.